It is 36 degrees Celsius in the shade at the moment and the dogs, normally happy to sleep in the shade outside, are stretched indoors cooling their tummies on the tiles. Outside there is not much happening. The cicadas are doing their thing but almost everything else seems to be sitting out the hot hours in whatever shade is available. Here indoors, things are much the same for us. Grandad, who is staying with us for a couple of weeks, is having a snooze on the sofa because the cat is sleeping on his bed while Pippa is crashed out on mine! Yesterday I spent the evening at the river. I arrived as the sting of the heat was beginning to subside and I stayed, not quite until darkness but until I had just landed a nice fish and didn´t give much for my chances of getting another before darkness arrived. 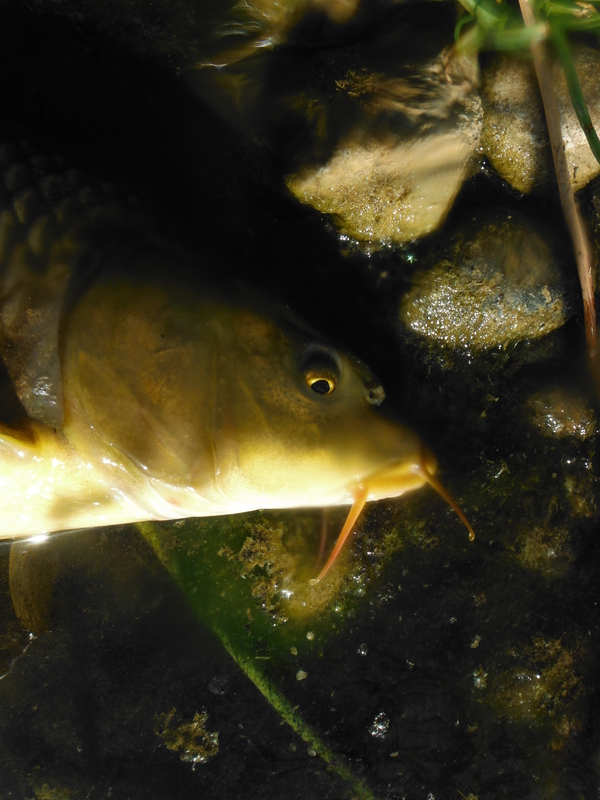 Generally, the fish can be taken throughout the day, although during the mid summer they tend to have times when they succumb to the general torpor that afflicts us all. It is really the comfort of the angler that leads to the decision to approach the river early in the day, or very late. It has been a little while since I had fished the river in the evening and it is a good time to be out. 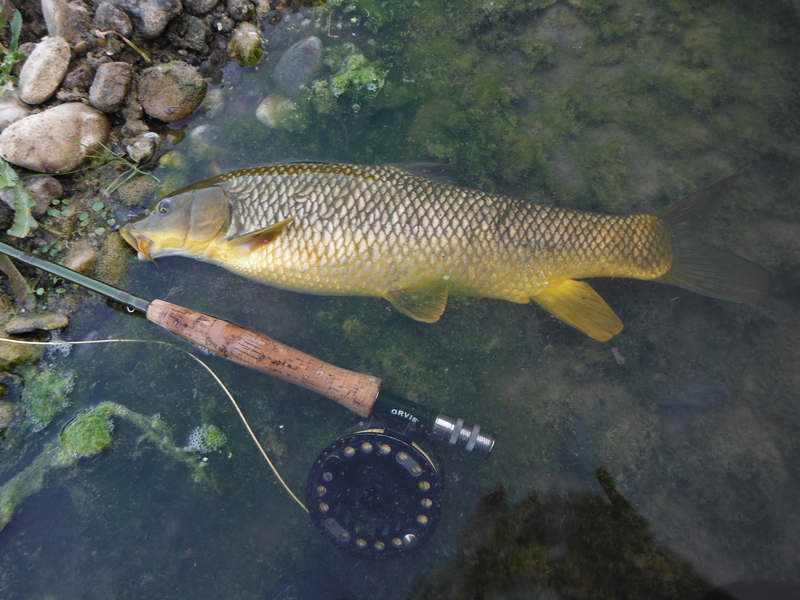 The first fish I hooked turned downstream from the mouth of the pool where it accepted my little hare´s ear and gave me a tour of every snag in the pool downstream. On one or two occasions it felt as though it had succeeded in depositing my fly on a submerged obstacle and only when I waded out to retrieve my fly did I realise that the fish was still on. I am very grateful to that fish for giving me a good reason to immerse myself in the river and cool off, and of course for remaining attached to the line when it looked like he had had the better of me. Out of curiosity I looked at my watch just after the fish had been released – 6.45 pm. Between then and hearing the nine o clock news on the radio as I drove away from the river I managed to catch about six barbel, of which four were of a good size. The river is thinning a little now and the better fish seem to be close to deeper pools but favour the current at the inlet. It seems that these fish are likely to take a fly although these productive stretches may be few and far between and taking a fish or two is likely to put the others, at the very least, on a heightened state of alert or, very likely to turn on their heels and melt into the deeper water downstream. These fish really are lovely but they are not in such good condition as during the early summer. For them the feeding is not so good as when the river is fuller and they have a chance to nose around in many of the reaches which are now shallow, or even dry.